Three Olympians broke three records as Day 2 of the 2018 U SPORTS Swimming Championships wrapped up on Friday evening at the University of Toronto’s Varsity Pool. The UBC women hold a commanding lead with 974.5 points, ahead of the host Varsity Blues (694) and Montreal Carabins (566). The Calgary Dinos (311) and Victoria Vikes (232.5) round out the top five. The men’s standings are tighter though as the T-Birds have 749.5 points, ahead of Toronto (634) and Calgary (568.5). The McGill Redmen (368.5) and Western Mustangs (315) sit fourth and fifth, respectively. 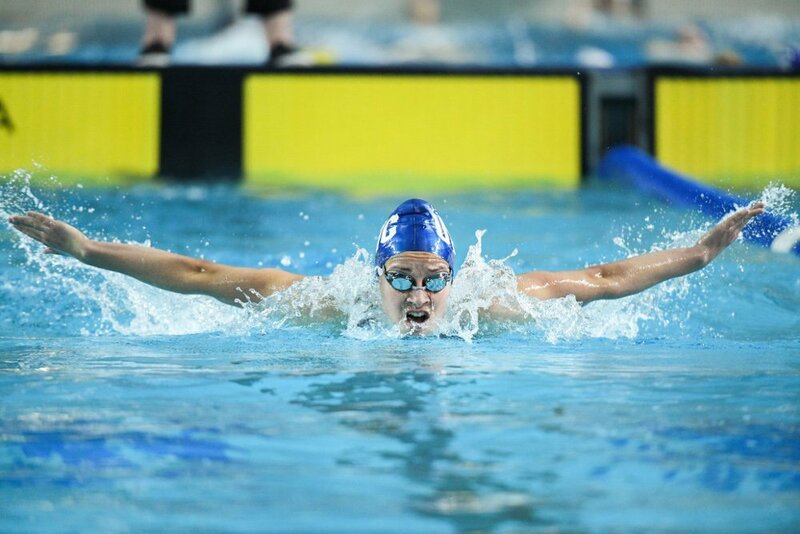 @ubctbirds continue to lead the team standings after Day 2 of the @USPORTSca Championships! 2016 Olympian Sandrine Mainville of the Montreal Carabins highlighted Day 2 with two gold medals. She wowed the crowd by winning her fourth career 50m freestyle title, topping her own U SPORTS record set last year (24.39) in 24.25 seconds. Mainville started the day by winning her second career 50m butterfly gold medal in 26.02 seconds. RECORD ALERT! GRAND SLAM! @sandy_mainville wins her 4th career 50 freestyle title in a new @USPORTS record 24.25 seconds! Varsity Blues star Kylie Masse claimed her third gold medal of the meet to kick off Day 2. The 2017 world champion and world record holder in the 100m backstroke won her signature event, bettering her own U SPORTS record in 56.38 seconds. UBC won five gold medals on Friday and leading the way was 2016 Olympian Yuri Kisil. Kisil broke the nine-year-old U SPORTS men’s 50m freestyle record (Colin Russel, Toronto, 21.73) in preliminaries in 21.69 seconds and went onto better that mark and win his third career title in the event in 21.50 seconds. Fellow Olympian Markus Thormeyer won his second individual gold medal of the meet, successfully defending his 100m backstroke title in 52.30 seconds. 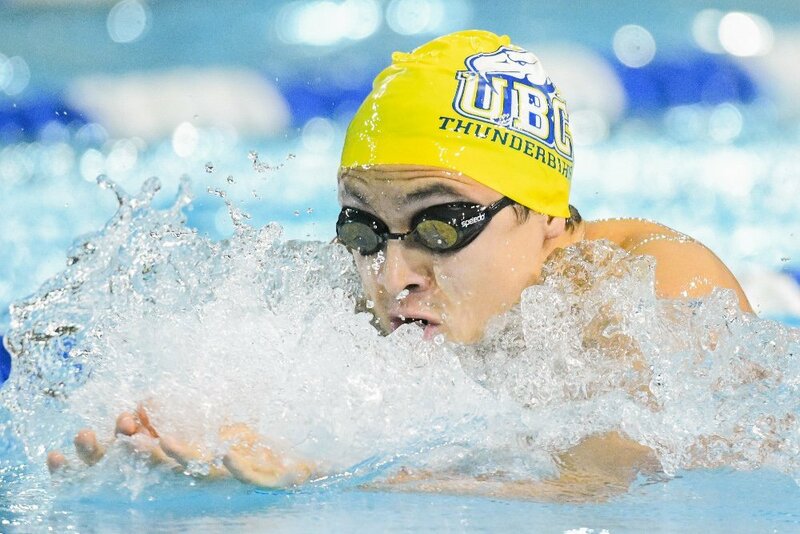 Fifth-year UBC veteran Luke Peddie took home gold in the men’s 50m butterfly, touching the wall in 23.87 seconds, just .07 seconds ahead of McGill’s Samuel Wang (23.94). Kisil, Thormeyer, Jonathan Brown and Josiah Binnema teamed up to win the men’s 4x200m freestyle relay in 7:10.07, while UBC’s women’s team of Erika Seltenreich-Hodgson, Maia Brundage, Emily Overholt and Megan Dalke won the event in 7:57.88. A pair of second-year Calgary Dinos won the 400m freestyle events. Peter Brothers earned his first career U SPORTS gold medal, winning the men’s event in 3:44.03, while Danica Ludlow successfully defended her national title, touching the wall in 4:05.98. The men’s and women’s 200m butterfly both ended in thrilling fashion. 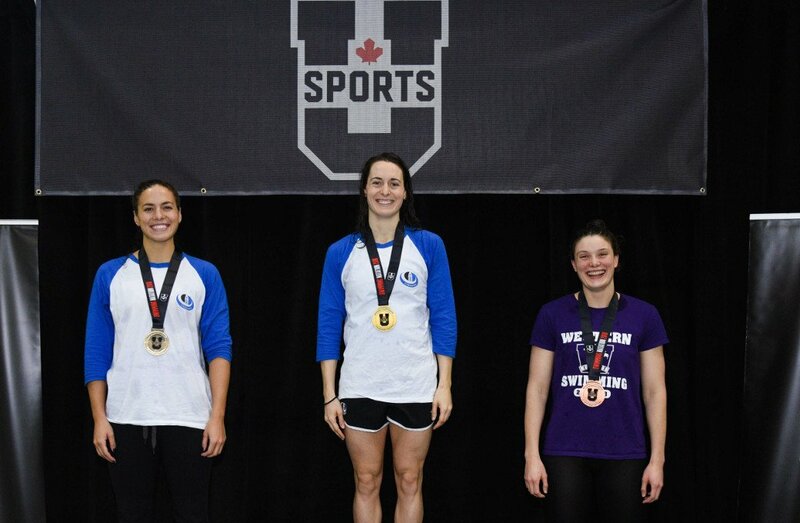 Danielle Hanus, a second-year swimmer with the Victoria Vikes, put on a show in the women’s event, overtaking Montreal’s Sophie Marois in the final 25 metres to win her first U SPORTS gold medal in 2:08.94. Fourth-year Ottawa Gee-Gees veteran Montana Champagne won the men’s race after claiming the silver medal at last year’s championships. Champagne overtook Binnema in the final 15 metres to win the second U SPORTS individual gold medal of his career. 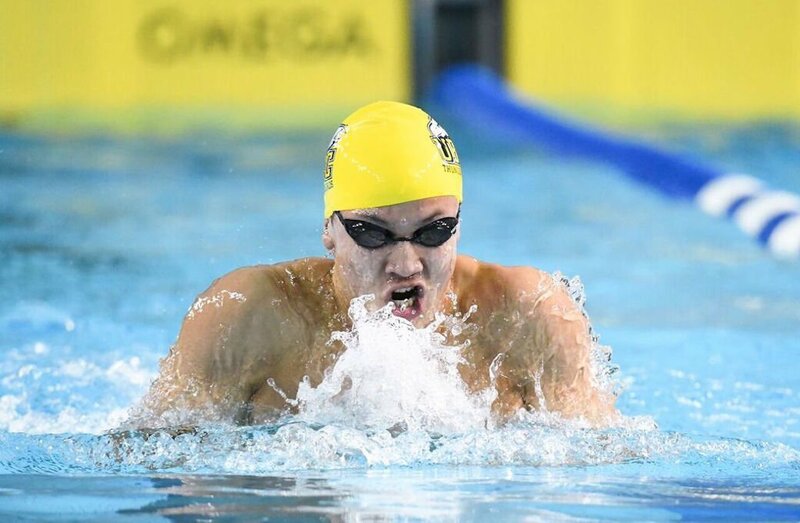 Varsity Blues veteran Eli Wall handily won his third career 200m breaststroke national title, touching the wall in 2:08.77, over a second ahead of Calgary’s Frederik Kamminga (2:10.32). Rounding out the champions on Day 2 was Manitoba Bisons standout Kelsey Wog. The sophomore won the women’s 200m breaststroke in 2:21.84, after claiming the 100-metre gold medal yesterday.